Useless Ramblings: # 39 - Movie Review - Trapped (2017) - Uncomfortable, Claustrophobic, Brilliant! # 39 - Movie Review - Trapped (2017) - Uncomfortable, Claustrophobic, Brilliant! Cast: Rajkummar Rao, Geetanjali Thapa. 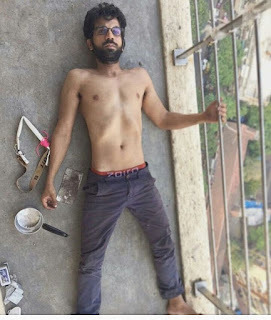 A man gets trapped inside a flat in Mumbai with little means of communication with the outside world. If the name of the movie doesn’t give the plot away, the trailer surely does. What separates ‘Trapped’ from ‘Castaway’ and ‘127 Hours’ is the fact that unlike other survivor dramas, the protagonist here isn’t stuck in the middle of nowhere, he is very much in a metropolitan city, but oh-so-alone. Rajkummar Rao plays Shaurya, a man who is desperate in more ways than one. There isn’t much of a back-story shown but thanks to the clever writing, direction and performance, one can figure out the missing details. As things stand, in the beginning of the movie, Shaurya is a bachelor who stays in a shared rented apartment and like so many of us, manages to survive in the Maximum city, just barely. He finds romance in office in the form of Noori (played by a very capable Geetanjali Thapa, who shines in spite of the limited screen-time) and chain of events lead to him shifting his residence to a flat in the yet to be occupied high-rise building ironically named ‘Swarg’. And yes, all of this happens within the first 15 minutes of the film. 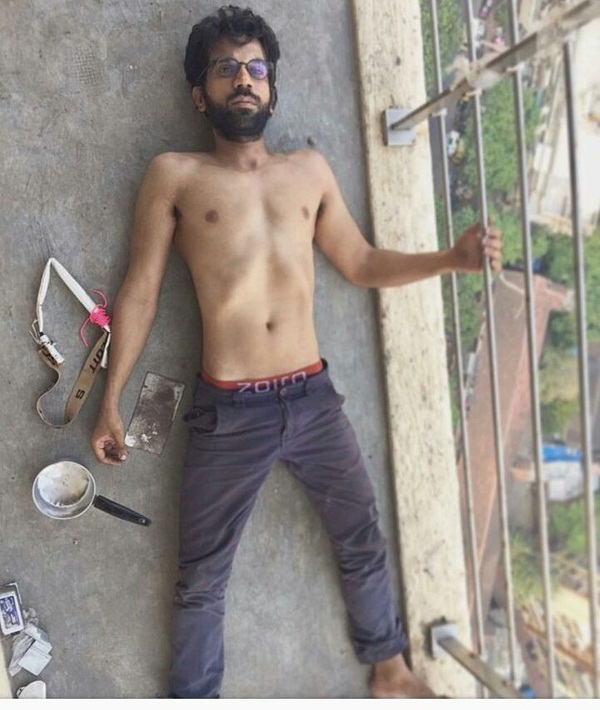 In a set of circumstances that seem scarily possible, he gets trapped inside his flat; what is somewhat far-fetched though is the happy combination of coincidences - no-one is aware of Shaurya's whereabouts, neither does anyone seem to note his disappearance from office, there’s no electricity, his cellphone is out of charge and his apartment has limited and unpredictable supply of water, these are of course explained in the plot, but the coming together of such chances are hard to overlook nevertheless. What follows thereafter forms the movie, and it is as much as Shaurya’s journey as it is the viewers, the (luckily) semi-furnished apartment becomes our jail as much as it is his. We celebrate his little victories and suffer as he suffers, and this is where the Director and Rajkummar Rao triumph. ‘Trapped’ makes you feel for the protagonist, you wonder what you would have done if you were in his place, you squirm uncomfortably as his desperation grows and he almost descends into insanity. It is a film that grabs you by the collar and forces you to feel uncomfortable and claustrophobic. It reminds you that the most crowded places can, in the right circumstances, be the loneliest. The sounds play more than an active part in this, refer to the trailer to know what I mean. Rajkummar Rao is fantastic, it’s tough to imagine anyone else play this role with as much conviction as he does. Brilliant casting. His take on the small town guy (I assume) in the big city, who has grand plans but little means is as believable as it gets. Having said that, he has played somewhat similar characters in different circumstances before (CityLights, Queen). Kudos to Vikramaditya Motwane for this film, he is now three films old, and they are as different as they can be. Also, because he hasn’t succumbed to directing typical potboilers yet, not that there’s anything wrong with that. Special mention of the scene at the Hospital - pulls at your heartstrings, despite the predictability. There are loopholes of course, apart from the coincidences mentioned above, one wonders from where Shaurya manages the seemingly unending reservoir of matchsticks, how he becomes a champion slingshot marksman (perhaps because he grew up in a small town? ), how he possesses the strength (of body and mind) to do what he does in the last 30 minutes of the movie, in spite of his limited food supply – but all that can be forgiven in the larger scheme of things. I watched ‘Trapped’ on a lazy Sunday evening and was pleasantly surprised at the packed hall; the fact that an unconventional movie made on a shoestring budget and devoid of ‘stars’, item numbers, and buzz surrounding its release could pull in such a crowd is testament to the fact that Bollywood and viewers have come off age. Now if only the rest of the stakeholders woke up to that fact. P.S. Read my short story about an odd building in the middle of the city here.